While I listen to the sounds of CFP at the Finnish weather station on Ovocny trh, I am slipping slowly into another world. The Ovocny trh is a rather quiet place compared to the crowded main square. People passing by look curiously at the grey container which stands in the middle of the square. They see a very dilapidated piano. When they read that this piano was exposed to Finnish weather conditions for a whole year, a smile appears on their faces. 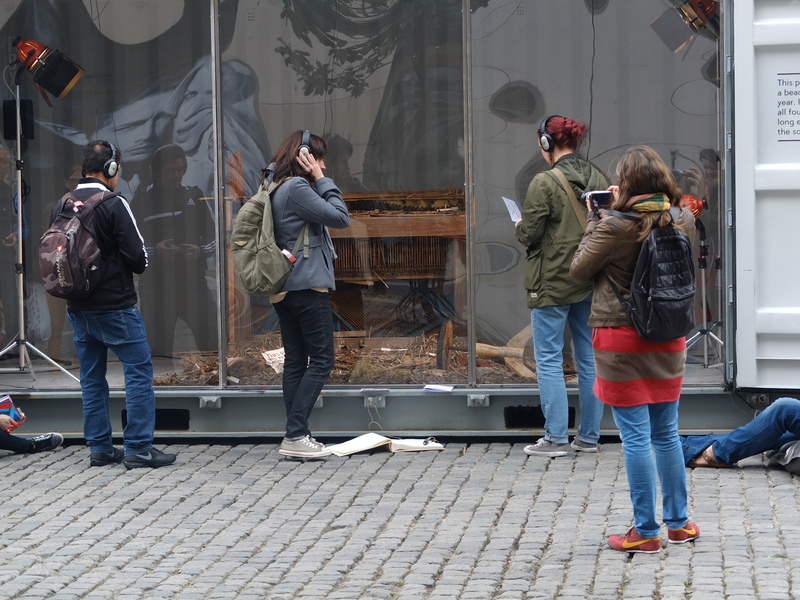 But only a few have the patience to put on the headphones and listen to the sounds emitted by this damaged piano. When a number of people take the time to join me in listening, I feel like we are all in a record shop looking out, allowing the sound to permeate our thoughts. And while I am sitting there listening, I increasingly get the feeling that I am actually in the container with the piano. I am not a part of the actual world around me anymore, but part of the installation instead. People passing by are not only looking at the piano, they are also looking at me listening. And maybe they think that because I’m listening, I know a secret, that they don’t know yet, and their curiosity makes them want to join me, and be with me in the container. We are not just in the container, we are actually on the beach with the piano for an entire year, experiencing all the seasons. I’m in Finland. Then I decide to take my headphones off and walk down the street.